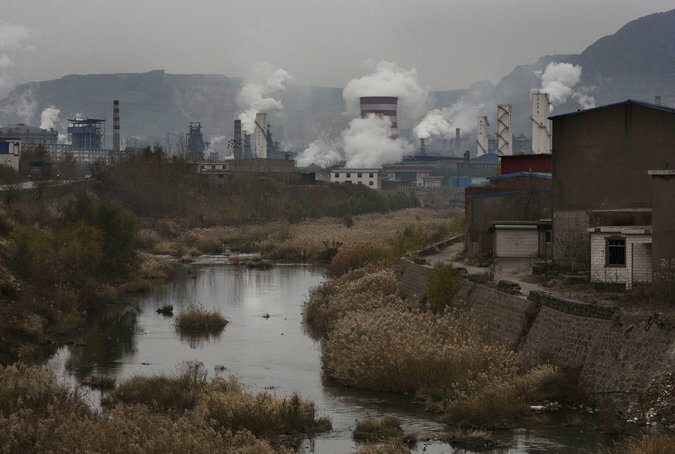 China seems to be paying the human price for lack of respect for environmental controls on industrialization. HONG KONG — The death rate from lung cancer in the heavily industrialized province surrounding Beijing has more than quadrupled in the last four decades, with researchers pointing to worsening air pollution as a likely culprit, according to a local cancer hospital and a report published Friday in an influential Chinese news outlet. From 1973 to 2012, lung cancer cases in the province, Hebei, soared 306 percent, well above the national average, and accounted for almost a quarter of all cancer deaths, according to figures from the Tumor Hospital of Hebei Province. By 2012, the death rate from lung cancer in the province, which has 74 million people, or almost twice the population of California, was 35.22 per 100,000 people. Lung cancer death rates in many American states are higher, but, in contrast to Hebei and other Chinese provinces, are on the decline, according to figures from the American Cancer Society. The hospital’s report said new cases of lung cancer were “rapidly surging” in Hebei, but it did not explore any possible causes of the surge. That may be because it touches on a very politically sensitive area: air pollution. A report on Friday in The Paper, a website based in Shanghai that cited the Hebei figures, approached the issue gingerly, citing an anonymous provincial environmental official as saying that since 2008, air pollution in the province had severely worsened. Chinese officials routinely censor news about how China’s rapid economic growth has given rise to widespread environmental degradation, including some of the world’s worst air pollution. Last year, a former television reporter’s searing account of the country’s catastrophic air pollution was pulled from the Internet after it caused a sensation. Hebei’s air pollution is among the worst, if not the worst, in China. China is the world’s top steel producer, accounting for about half the world’s output, and Hebei is far and away China’s biggest steel maker, according to official figures. Satellite photos of northern China regularly show a miasma of smog centered on the province, home in 2013 to the six most polluted cities in the country, according to Greenpeace. Separate reports show that lung cancer rates in the cities of Beijing and Tianjin, both bordering Hebei, have also increased. In Beijing, the incidence rate for males was 75.2 per 100,000 in 2010, a more than 50 percent rise from eight years earlier. For women, whose smoking rates are far lower than for men in China, the incidence rate also rose more than 50 percent during the same period, to 45.9 per 100,000, China Daily reported in 2014, citing Wang Ning, deputy director of the Beijing Office for Cancer Prevention and Control. A 2009 research paper whose lead author was He Yutong, chief physician at the Hebei Tumor Hospital, ruled out increasing life spans as the main cause for the rise in lung cancer deaths in the province, stating that the research pointed to air pollution as a chief cause. Other factors may also be important. Smoking rates in China, at least among males, are far higher than in many countries, including the United States. Chinese men, who constitute about a tenth of the world’s population, smoke one-third of the world’s cigarettes, a study published last year in The Lancet found. Follow Michael Forsythe on Twitter @PekingMike.